This property was exactly what we were looking for. It was super spaciest, clean, convenient and located right in front of Kamala Beach!!! Clean rooms and easy accessibility to everywhere around phuket if you drive. Jacuzzi bathtub is dirty and smelly when you use the massage system. Please avoid using it. Staffs are helpful. 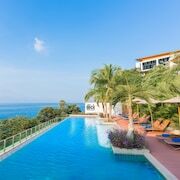 Situated in Patong, this apartment building is within a 5-minute walk of Kalim Beach and Patong Beach. Jungceylon Shopping Center is 1.6 mi (2.6 km) away. We had to carry our bags to level three where we stayed and there is no elevator in hotel. Staffers are lazy and unhappy Adds look good but actually no value for money and I will never go back there. Great hotel in the middle of Phuket town! Very unique and great value for the money! Large rooms, nice bathrooms, friendly staff, and plenty of amenities. Definitely recommend for anyone doing light traveling or backpacking. 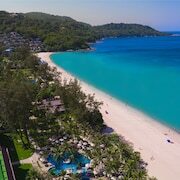 There are plenty of places to stay in Phuket with 2982 hotels and other accommodation options to select from, including 281 apartments. Why not enjoy the treasured shops and scenic seaside in this relaxing area? Patong Beach and Chalong Temple are top attractions worth a visit. Are you thinking about apartments over traditional hotel rooms? An apartment features a kitchen for convenient meals, and is often more spacious than a traditional hotel room. Though weather is just one aspect, it can impact your holiday, especially if you are planning a longer stay. And since apartments often have more rigid cancellation policies, it’s good to familiarise yourself with these seasonal weather averages before you book your trip. Phuket is well regarded for its seaside and shops. Cultural attractions include Phuket Trickeye Museum and Thavorn Museum, whereas Patong Beach and Promthep Cape are a couple of picturesque spots to enjoy the outdoors. You can also visit some other popular places in town including Chalong Temple and Phuket Aquarium. Fly into Phuket (HKT-Phuket Intl. ), which is located 16.7 mi (26.9 km) away from the city centre. You can also search for flights into Krabi (KBV-Krabi Intl. ), which is 43.1 mi (69.4 km) away. If you'd like to venture out around the area, consider renting a car to take in more sights.